India is amongst the fastest growing economies in the world. The country has immense potential for each industry and sector to flourish and particularly for the banking industry, the time has never been better. The Banking Laws (Amendment) Bill in 2012 has changed the landscape forever. The last decade has been pretty impressive for the Indian banking sector, with banks and their customers embracing strong measures and processes. RBI stressing on the policy of financial inclusion has led to a renewed emphasis on rural expansion. The Reserve Bank of India announced a few measures in its bi-monthly monetary policy on June 3, 2014, that includes an increase in the foreign exchange remittance limit to $US125, 000 from the previous limit of US$75,000. In addition, the regulatory bank has also simplified the rules for credit to exporters. They are now eligible to receive long-term advance credit from banks for up to 10 years to service their contracts. In 2013, around a dozen Indian companies either sold or intended to sell their assets to remove at least Rs. 3.5 trillion worth of debt, as rising interest costs and diminishing margins dented their growth prospects. In 2014, the trend will intensify even more. Plus, if the RBI governor RaghuramRajan has his way, banking licenses could be given on tap. Currently, this seems an impossible idea. However, in future this could very well be the possibility. When the first round of licenses were issued to 10 private banks in 1994, the primary objective was to introduce competition in the sector. However, now the focus has shifted to financial inclusion. The country needs more banks and ATMs for the unbanked population. According to an IMF report of 2011, the country currently has 30.34 bank branches and 25.43 automated teller machines (ATMs) for every 1,000km. Compare this to China that has 1,428.98 branches and 2,975.05 ATMs for every 1,000 km and you will know there is much ground to cover here. For the new licenses there are 25 applicants in the race, three of which belong to the corporate sector, namely the Aditya Birla Group, the Bajaj Group and Anil Ambani’s Reliance Group. According to estimates the size of the banking assets in India is greater than US $1.8 trillion in FY13 and will touch US$28.5 trillion in FY 25. 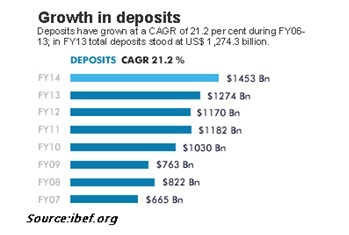 The bank deposits have also grown rapidly with a CAGR of 21.2 percent over FY 06-13. In FY 13, total deposits were US $1,274.3 billion. During the decade spanning from 2001 to 2010 the revenue of Indian banks has increased from US$11.8 billion to US$46.9 billion. The profit after tax also got exponentially increased to US$12 billion from US$ 1.4 billion. The credit card and personal loan market has also witnessed healthy growth. The biggest private bank ICICI Bank saw 141.6 percent growth in personal loan disbursement in FY 14, according to a report by Emkay Global Financial Services. 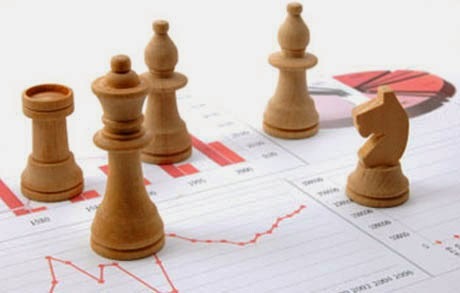 The Indian banking industry could very well become the fifth largest in the world by 2020 and climb further to third position by the year 2025. The focus of Indian banks is now on improving customer experience through giving a facelift to the existing technology infrastructure. This also results in providing competitive edge to the banks. To facilitate the same, the sector can create 20 lakh new bank jobs in the next 5-10 years. With nearly half of the workforce at public sector banks scheduled to retire in the next few years, hiring trend may get a further boost. As per estimates provided by HR services major Randstad India, the banking sector will witness generation of 7-10 lakh jobs for the coming decade. The financial inclusion plans of government which we have talked about in the earlier part of the article deem it necessary for the top banking firms to expand and venture into the previously untapped market which again will require a larger manpower.